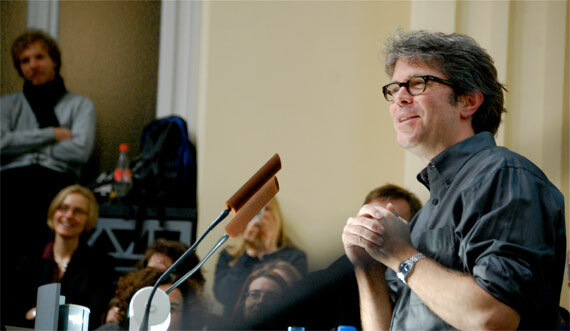 In Germany to deliver a talk on fiction, Jonathan Franzen couldn’t be more American. He is friendly and informal, casual and comfortable, approaching the podium of a University of Tübingen auditorium so packed that students are sitting on the floor in front of the podium and on the stairs between the seats. A few even perch up on the broad windowsills, two or even three students to a window. About to kick off a week-long series of lectures and discussions, Franzen has his talk printed out in a sheaf and rolled up sort of nervously in his hands. Then he realizes the Germans haven’t finished introducing him yet, have actually only finished the first half of an introduction that will describe him in ways that might be more fitting for a landscape or a panorama; proclaim him to be the most significant voice in America, an arbiter of its culture and an example of the best of its art; and awkwardly recommend him for the Nobel Prize. It is only half over and he’s embarrassed himself by standing up in the middle. He grimaces, mouths “Sorry,” walks back to his chair in exaggerated tiptoe, and sits down. Midwesterners, and Americans generally, often carry with them this suspicion of the formal and overly complicated – a fear that, other times, is expressed as a commitment to hospitality, honesty, and egalitarianism. In a piece in The New Yorker, in 2002, Franzen cringed in print at the thought of his mother asking him “if he was just showing off” with the big words in his third novel. She was, he writes, “a lifelong anti-elitist who used to get good rhetorical mileage out of the mythical ‘average person.’” In the essay, “Mr. Difficult,” Franzen finds himself caught between two models of the novel. One, which he calls “Status,” values a novel for its appeal to an elite. The harder it is, the better. The other sees the novel as a “Contract” between reader and writer. It’s the novel as an exact balance between entertainment and having something serious to say. “In my bones,” Franzen confesses, “I’m a Contract kind of person.” A great novel, according to this model, will aspire to the broad middle, neither showy and elitist nor low-brow and trashy. This is the novel that, if it were a politician, could win 51 percent of the vote. The comparison to politics is actually helpful here. If you’re on the political fringe in America, you find yourself weighing two possible rhetorical moves. The first is to defend extremism, almost abstract extremism, extremism for its own sake. You deride the democratic majority, calling them “sheep,” unwitting pawns of powerful forces. Thus your fringe status is a sign of the value of your ideas, marking you yourself as one of the few, the chosen, those who really understand. This is the move of anyone quoting Barry Goldwater on extremism in defense of liberty. The other possible move is to attempt to redefine everything, to re-frame the picture so that you are actually at the center. Everyone else is on the fringe, the real crazies. This is what libertarians do with their World’s Smallest Political Quiz, wherein, through “just the honest magic of truth and common sense,” libertarians fall at the center and top part of the map, while mainstream Republicans are a dot on the far right, along with fascists. (Liberals and anyone who doesn’t think the government should be shrunk by 50 percent or more is out on the left with the commies.) The move is actually kind of brilliant, in that the reframing appears natural, and it’s hard, while looking at the redrawn Bell curve, to notice immediately that the terms being used aren’t quite the common, accepted ones. Do your characters sometimes take over and take on lives of their own? Is your writing really autobiographical? By way of answering them, Franzen talked about the moral struggle of writing, and – quite openly – about his own personal efforts as a writer to overcome shame, guilt and depression. “Unless the writer is personally at risk,” he said, “it’s not worth reading, or, for the writer, worth writing.” Early on, though, Franzen made a little detour, an almost-aside, in which he attempted deftly, like the libertarians noted above, to reframe literature so that he and his project occupied its absolute center. He began by dismissing genre novels, pushing them to the one side of literature, as “a literature of diversion.” He then dismissed experimental novels, postmodern writing and “art novels,” pushing them to the other side as, also, “a literature of diversion.” He cast genre writing as harmless but unserious, and experimental writing as unserious but harmful. However, problems arise from the conflation of what something is and what something should be. For one thing, Franzen’s definition of the literary novel doesn’t really leave space for a failed work, something that takes the human condition as its subject, but isn’t successful. He also, at this point, took a little hop-skip and said literature is about “people as they really are” – as if realism were as natural as breathing. In fact, novels are not and never could be just simple reflections of reality, but are always and have to be constructions, artificial and formal mediations, interpretations. Moreover, it’s not at all clear that this description of literature as being about “people as they really are” will divide writing in the way Franzen wants to divide it. It doesn’t seem obvious that a story about a man turned into a bug, just to use Franzen’s own example, is about humans “as they really are,” in some way that, say, Leonard’s story about former ’60s radicals on a for-profit bomb spree is not. Afterwards, I asked Franzen whether his aversion to experimentalists included his good friend David Foster Wallace. After all, everything Franzen said he didn’t like could be (and has been) used to describe Wallace’s writing, and yet Franzen has never seemed to think of him as an enemy of the novel, or to cast him beyond the boundaries of the literary. Franzen offered three not entirely compatible answers, illuminating some of the unexamined tensions among the Midwestern virtues extolled in “Mr. Difficult” – hospitality, egalitarianism, and candor. First, Franzen insisted that he really wasn’t decrying experimentalism, and threw out some names of experimental writers he liked. Instead, right now, he was really opposed, he said, to the “sentimentalists.” When asked whom he would describe as a sentimentalist, however, he made the motion of zipping his lips and throwing away the key, which isn’t exactly the best way to oppose something. The sentimentalists, he said, were writers who wrote with a sort of moral superiority. the point at which writing becomes easy for a writer is where it becomes unnecessary to read that writer…. What turns out to matter most is that you write as truthfully as possible. And so Franzen’s fear of being mistaken for an elitist ultimately seems like a distraction, for himself and for his readers. If we disregard his rather conservative attempt to demarcate the boundaries that divide literature from mere writing – if, that is, we disregard his abstract pronouncements and look instead at the writing he admires, it becomes clear that he values above all the great moral effort to be honest in writing, no matter what form it takes. And here we must side with Franzen against himself. In the end, honesty is the moral project that divides good writing from bad, whatever “literature” turns out to be. Daniel Silliman is an American writer living in Tübingen, Germany, where he is getting a Masters degree. He has worked as a gardener and gas station attendant, a Wal-mart shelf stocker, woodcarver, tree cutter, college teacher, and a crime reporter for a daily newspaper. More of his writing can be read at danielsilliman.blogspot.com. It wasn't easy. I wanted to finish a book. Be a good dad. Get an MFA. Be a good husband. I'd lined up a teaching job at a university in Beirut. Got an essay in a publication that might impress you. Called my mom as much as I could. I couldn't call my dad, he was dead. When do you know if it's actually starting to add up, when you can say, OK, yes, this is real, it's actually happening. “HELLO MY NAME IS MARX,” read the candy cane colored name tag handed to me. One woman actually said that I looked like a Marx, the scruffy beard and omni-directional head of hair. Another teased that she and I ought to make Marx the latest mintage in Manhattan baby name trending by starting a blog to promote it. A University of Chicago grad said, “Go” — she was ready to talk me under the table with Marxist theory, and when I protested how little I actually remembered off the cuff, she said she would settle for Durkheim, Weber, or Mills. Wasn’t there someone? Goffman? I responded, Nietzsche: Down with the old gods, up with the mania for replacing them! Then our time was up. I joked about how I intended to use the event and number of dates I would meet as a chance to rally support for socialist thought and motion toward a groundswell to upend the capitalist system, which, didn’t they agree, had gone on long enough? With doomed grandeur, F. Scott Fitzgerald wrote that “there are no second acts in American lives” — not accounting, perhaps, for the fortune and fame that could follow publication of a memoir premised on there being no second act. Fitzgerald lived true to his word: his twilight in Hollywood, the mythic cradle of American radical self-reinvention, figured as a long wait for the notes of the nightingale’s song to sound. Marx, on the other hand, declared that everything that has ever happened happens twice: “the first time as tragedy, the second as farce.” The third time, fourth, fifth, and so on, we are on our own. Not everyone knows, per Jonathan Sperber’s recent bio, that Karl Marx’s earliest manuscript was called The Book of Love. Student Marx composed the collection of romantic poems for childhood sweetheart and lifelong partner Jenny von Westphalen. Over the course of their lives together, his romance with Jenny transformed into a romance of a different kind, a belief in the inevitability of international revolution whose contours were somewhat hazy, if keenly felt. This is what happened on the day before Valentine’s Day, 2013, a Wednesday, at the Housing Works Bookstore on Crosby Street just south of the Calvin Klein billboard in SoHo. A first ever. A good cause: “I Like Your Glasses: Literary Speed Dating.” Each participant found at the entrance a neon green envelope, including a library card in manila sleeve for taking notes on each “date,” and a name tag featuring the handle of a character from a favorite book (favorites requested earlier by e-mail). These would be our pseudonyms for the night. Each date would last an almost militantly enforced four minutes. A single case of lingering — whether affectionate, desirous, or uncertain — could cause the entire caterpillar crawl to go legs up. There was to be no lingering. Lingering is for books. We each were to have brought one, a title to display for the sake of conversation. From my messenger bag I drew John Barth’s Lost in the Funhouse. Each “date” station had a name — my point of origin dubbed Heorot for Beowulf’s banquet hall where Grendel was a regular gate-crasher. Café tables set in rows through the heart of Housing Works Bookstore’s assembly space formed the stations, solicitous waiters snaking around them to offer speed-date refreshment, tonic of composure or forgetting. Two emcees spoke over a scratchy sound system by the bathrooms, raging like Dylan Thomas against the frenetic buzz of our voices. They joked we would hate them and use our hatred of them as grist for conversation with the strangers across from us. I succeeded at not mentioning them until my final match of the night, a brunette with an anchor tattooed on her bare shoulder. Her pseudonym was Estha, one plucked by the organizers’ naming committee from Arundhati Roy’s The God of Small Things. I looked at her and she looked at me, fleetingly at one in our total disdain for the emcees as they pleaded everyone be quiet. In that moment, I am sure of it, we both wished for their overthrow. This was as close to authentic connection as I found. Estha was probably about five years my senior (although, impossible to say: she could have been 29, too, a lover of the wind and the rain and the sun on her cheeks). She said that she was bouncing back from a divorce to the guy with whom she had cofounded a restaurant in Brooklyn — the same restaurant, it turns out, I went to on my first date with the last woman to cohabitate with me. I was touched by the coincidence and the total lack of rationale for verbalizing the coincidence to Estha, as we had about a minute left in our exchange, and a top 10 rule of first dates, the real kind, is not to mention exes unless desiring to come off as a pet pitifully leashed to a station wagon pulling obliviously away and gaining speed. My eyes might have gone a little fuzzy, all the same, and Estha took my expression of fuzziness for susceptibility, emphasizing how she always made sure to mention the name of the restaurant she and her ex founded when possible. I realized Estha, like me, was attempting to find a purpose for the evening, what it had really all been about, if it had not been what it was supposed to be about (the exceedingly worthy charitable cause, notwithstanding). What it had all really been about, I decided, was capitalism, making a product of ourselves and pitching it to strangers at four-minute intervals: life as an ad incarnate. Estha, at least, had the class not to be promoting specifically herself but a physical location in the world that she had played a part in dreaming a reinvention for, one that we, any of us guys carouselling by, could go visit. There was also Karenina from Idaho — a girl from Idaho! — and June, who was quiet, and Ruth, whose pseudonym’s source text was, for me, a winner, and Grace, who knew her political and sociological thinkers, and Kit, who laughed at me or an awareness of the cool, amusing film through which we saw each other, the cattle stall of the standard speed dating experience retrofitted with funhouse literary mirrors. I tried not to steal peeks at the next woman over both because it was rude to the woman I was speaking with and because I wanted every meeting to be a surprise with a genuine response, not performed or calculated. Though, Reader, I tell you, my naïve ambition became difficult to maintain as I stood up to move on to Calliope of the Marx babies, then Babette, who had the air of a cigarette-smoking beauty queen, and Anne, and Hazel, and Lizzy, and my consciousness of the fact that the more I repeated myself in response to the same questions, the less sincere I became, our comedian hosts droning on, their voices insistent, their words incomprehensible, the face presently across from me feeling more and more like a test-marketing subject for a new product which was My Projected Self. Shame at projections gone awry sloughed away as new conversation played immediately over old, like a new album in place of last year’s, with Daisy, who wondered whether or not she ought to read The Corrections, and Margaret Peel, who was significantly older and to whom I said I was probably not the guy she imagined meeting that evening, but what about her make-believe name, its literary origin? (Lucky Jim, she explained, our organizers having conflated her favorite author, Martin Amis, with his father, Kingsley, then named her after a character in Kingsley Amis’s most famous novel, a novel she had never read…although I had, I was reminded then), and Isabel, whose expression was like a runner’s in the early miles of a race, and finally, Estha, of the anchor tattoo and lovable Brooklyn restaurant. One thing about capitalism, I have noticed, is that its appeal is never stronger than in the aftermath of a breakup, love spilling forth from the vessel that shaped it, all that energy and longing to be known and to know in turn seeking new forms to cleave to, things that did not previously define you. Conceivably a human being could live this way forever, making bonds, breaking bonds, and reaching out through expenditures of concentration and will to take on more trappings, assume other forms, a kind of perennial runaway from the prurience of small-town gossip and stifling judgment, glorying in the purity of the new. There is what we forget and what we remember, and I cannot say for certain how accurately I have recalled an event now seven months distant, or where fiction, despite conscious intention, has blurred the edges of fact and so made them softer, the facts, but thematically more concentrated, molding from a chaos of temporarily overlapping paths something that reads as almost retraceable. A moment of possible return. To find yourself speed dating is to acknowledge, at least to yourself, not without humor, a waywardness of romantic course, to become increasingly conscious of yourself as an advertisement for yourself, a mercurial herald, as you move from one table to the next, one consciousness and then another and another flitting by image-saturated eyes. In your remove, the recognitions you have but don’t speak, a story begins to build, refined by each new face, each curious glance, the unspoken attempt to find a hold in the world everyone shares. It is almost possible to believe that the world consists entirely of surfaces and that the ones presently before us are the only we will ever know. If it is true that capitalism is the final organizing principle humanity will ever know, the snaking tables around which we are to carousel forever, but not just capitalism in the abstract, but this capitalism, where big companies merge with big companies, big publishers with big publishers — the fewer meaningful players on the field, the less actual competition, the closer our capitalism resembles Soviet Russia, a state ruled by one all-encompassing company whose elite direct the bureaucratic circus — then I might have been seeing symptoms in the material conditions of the speed dating scene, or the shape the material conditions gave my sense of self, those of us on the carousel that night in February. As we passed each other by, our personalities become weightless, the stories inside the books we carried felt more and more real. It’s a shame that the title is already taken, because “Advertisements for Myself” would be the perfect title for Franzen’s next book of essays. His malignant narcissism should ne funny, except it isn’t. Wherever Franzen goes, there goes Literature. It would seem that Franzen thinks he owns the book even after it has been published and is in the public domain. He needs some extra theoretical understanding. It is the readers not the author who decide what is in the book. We readers can choose to look at an author’s biography, take into account the culture of the period and use our minds and our ideologies to invest the book with our own meanings. Authors are not important once they sell their work!! I mailed my book to Jonathan Franzen’s publisher, in the unlikely scenario that it would reach him. I included a little note explaining that I had been deeply impacted by his work, particularly The Discomfort Zone. A month later, a postcard arrived from Jonathan thanking me. A good man if you ask me. ps. I think Mendelsohn’s got it wrong about Snoopy, who’s really like Monkey, in Journey To The West – an untamable Blakean spirit, forever dancing free. It was about half way through Deborah Eisenberg’s reading that I saw that familiar shape. The back of a head, maybe six rows in front of me and off toward the aisle. It was unmistakable – balding, grayish and round, round like a human head really ought to be, perched on the shoulders of a diminutive gentleman. It was unmistakable, yet highly improbable, given my complete ignorance of Deborah Eisenberg’s private life.Question: what do The Moderns (IMDb), My Dinner With Andre (IMDb), The Princess Bride (IMDb), and a number of Woody Allen films all have in common? They all benefit from the presence of the great Wallace Shawn, actor and writer. And there, on a cold late-October afternoon, in an auditorium down by the lake, was someone who looked exactly like Wallace Shawn. At this point I was not even entertaining the possibility that it really might be him. After all, why would Mr. Shawn leave the familiarity of his Manhattan apartment for the chill of Lake Ontario? In October? That, to pilfer shamelessly from the man himself, would be inconceivable. No, it must be his double. A northern doppelganger for the ultimate New Yorker.Then intermission came. I espied Ms. Eisenberg up in the balcony, and there, beside her, was that unmistakable head, now absent from the seat in front of me. Suddenly my doppelganger theory was becoming increasingly less likely, and what was once inconceivable was now irrefutable – Wallace Shawn was in the audience. A quick Web search later that day would fill in the blanks, and inform me about the decades-long relationship between the two.After the readings, there he was again – standing alone in the foyer, looking bemused. (When does he ever not look bemused?). So I approached and said to him, cleverly, “Hey, you’re Wallace Shawn!” “Yes !…. I am!” he exclaimed sounding like every comic character he’s ever played. I then welcomed him to Toronto and told him how much I enjoyed his work. He replied with a cheery “Great!” It was at this point in our Algonquin Round Table discussion that an elderly gentleman brazenly muscled in on our conversation, and so I retreated. All those questions left unasked – not just about his own work but that of his father, legendary New Yorker magazine editor William Shawn. Ah well, another time.As for Deborah Eisenberg, she delighted the audience with a short story from her latest collection, Twilight of the Superheroes. The story – “Some Other, Better Otto” – introduced us to a 60-ish grouch named Otto, and his much younger lover, the thoughtful William. Otto was bringing William to a Thanksgiving celebration where we would meet his siblings. As Eisenberg says, you meet people in your family that you would never happen to run into otherwise.Eisenberg’s reading was one of the highlights of the International Festival of Authors, ten days of readings, talks, and panel discussions. Another high point was the chance to hear, and later to briefly meet, Edward P. Jones, who read from his story “Blindsided”, from his latest collection All Aunt Hagar’s Children. Blindsided begins with a black woman’s bus ride to see Sam Cooke in Washington D.C. Prior to her outing, her white boss warns her that all black peoples’ entertainment will lead to blindness. And during the course of the story, on the bus ride, she quickly and unexpectedly goes blind. And that’s just the beginning. With its eccentric characters and the heart-breaking plot, the story delicately balances humor and moments of extreme poignancy.The iconic Ralph Steadman, in town to promote his book The Joke’s Over, was also at the festival presenting a slideshow of his illustrations, many of which have given surreal shape to Hunter Thompson’s hallucinatory and incendiary prose. Indeed, throughout Steadman’s slideshow, with its verbal asides, his late friend and partner-in-crime was ever-present.A couple of years ago I read and wrote about Alberto Manguel’s A History of Reading in which he touches on the library in all its variations, throughout history, throughout the world. Now Manguel delves even deeper with a new work The Library at Night. During a reading and a panel discussion at the festival, Manguel spoke of his own private library in France, of losing himself in its stacks, and of the distinctions between day and night. During the day, one seeks to find – one moves purposefully. At night, the activity becomes more ghostlike. Books speak to each other and conspire, the searcher going wherever the books lead him.Manguel contrasts the processes of reading and writing (two different kinds of solitude). After writing, the writer likes to be with other writers who understand, but not necessarily to talk about the specific work. More of a silent understanding. Whereas after reading and being moved by a written work, a reader becomes evangelical about it and would like nothing more than to spread the word.He also contrasts such classical libraries as Alexandria (the library that contained everything) with the web (the library that contains anything.) He’s far from anti-internet, but believes it must never take the place of the real thing. And he prefers his own massive private library to public libraries or archives if only because he would always want to keep the book, and mark it up. Manguel loves the tangibility of books. One’s own books. They remind us who we are, he says. They provide optimism in the face of encroaching stupidity and horror.